The day started with quiet seas, a couple of rain drops and then sunshine... pleasant conditions for boating and great whale watching conditions on the fjord. The whales were rather far from Akureyri both in the morning and in the afternoon so a certain amount of patience was required from all but the weather and view made up for it. We eventually found a few humpback whales between Hjalteyri and Hrisey. They were all taking advantage of the stillness and have a well deserved nap! Whales can feed up to 22h a day so they definitely deserve a nap every now and then. 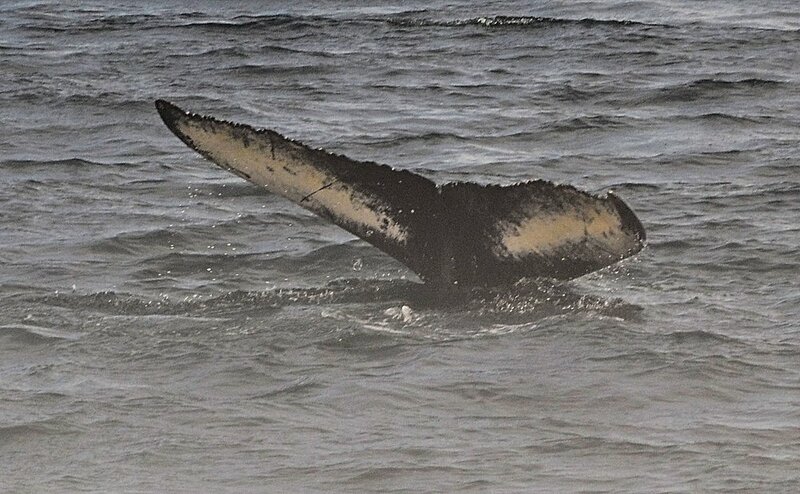 On the afternoon trip, we found a pair of whale that were most likely a mother and its young/teenager (most likely). The mother appeared to be showing him/her the ropes. Duck-diving, coming up to the surface for a couple of breaths and then going back down again for 7 to 10 min. The dives were slightly longer than the usual average but then again, they weren't in the usual area and a pair of this nature is not often spotted here. On the way back from both the morning and afternoon tour, northern bottlenose whales were spotted (only briefly on the afternoon tour) and a minke whale seen also close the Akureyri harbour. The day was rather peaceful on the fjord but the rain caught up with us in the harbour later afternoon.. Photos and text by Liza Roger.